The Australian warbler family of birds is a very active group, hopping over the ground and through the foliage of the trees or bushes. Some species can be very mysterious in their behavior. Most species tend to be sedentary and tend to stay in the same area throughout the year with only local movement. However, one species, the white-throated gerygone does migrate into southeastern Australia in the spring. All other species are weak fliers. In song and vocalization, most species are melodious, loud, and have distinctive voices. Some are even gifted mimics, able to copy or imitate other species' calls. Others have only buzzing, trilling or rattling notes with short quiet songs. Certain species like the bristlebirds have whistling calls that are carried far in order to announce their presence. Some species are cooperative breeders, where nonbreeding birds assist the parents with the care and protection of chicks, while in other species only parents raise their chicks. The breeding season lasts from late winter to early summer. Several breeding attempts occur each season. Nests are domed, usually placed in trees or shrubs, with some in crevices and hollows, or even on the ground. Clutches commonly include two eggs, but have been observed with as many as five. The color of the eggs comes in many forms including white, white with sparse spotting, cream or buff with widespread spotting, and chocolate. 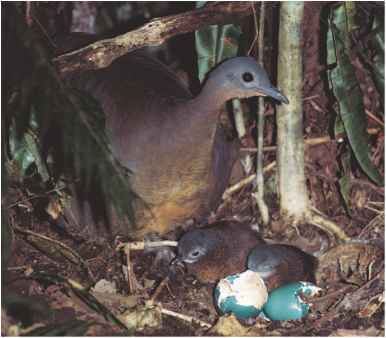 The eggs that are incubated only by the female are laid at forty-eight-hour intervals. Incubation and the independence of fledglings are both accomplished over a long period of time. Both parents, and sometimes the helpers, feed the young. Many nests succumb to predators. Bronze-cuckoos lay their eggs in some nests and kick out the young warblers. Adult survival each year is as high as 80 percent—a high percentage for birds that are so small.